Cooking pumpkins are smaller versions of a jack-o-lantern pumpkin and are all you need to make this quick, fresh and healthy pumpkin puree. Who doesn’t love some pumpkin treats in the fall? My favorites are pumpkin pie and pumpkin bread. I was used to using a can of pumpkin for the pumpkin puree called for in these recipes. 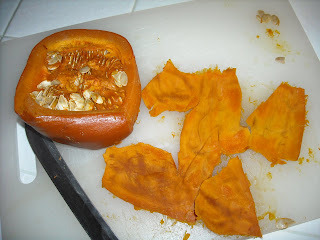 Then I learned how easy it was to make my own fresh pumpkin puree. Fresh is always best!! Start with a fresh cooking pumpkin aka sugar pie, baby bear or cheese pumpkin. They are found in the produce section of your local market and are small is size, usually around 3-4 pounds. The skin is thinner and there is more flesh than a jack-o-lantern variety pumpkin. You don’t need to buy the organic version (unless you want to spend the extra money) because the skin of the pumpkin is thick enough to ward off any pesticides that might have been used near the growing process. Cut the pumpkin in half and place pulp side down in a 9×13 baking dish. Add 1/2″ water to the dish. Bake at 350 for about 45 minutes or until a knife easily pierces the pumpkin skin. You might have to add a little water to make sure it stays around a half inch depth so that the pumpkin doesn’t dry out. Remove halves from dish and let cool. Scoop out the seeds and mushy strings and discard. Spoon out the remaining flesh for the yummiest, freshest, pumpkin puree ever. One small pumpkin makes enough puree for a recipe calling for one 15 oz. can of pumpkin. Pumpkin puree freezes well for later use. DIY Fresh Pumpkin Puree tastes great in pumpkin chocolate chip muffins. My grand kids love them! !